Where have all the insurance consumers gone? To the channel of their choice, likely. Lured by the ease and accessibility of handheld and desktop devices, insurance buyers are going digital, searching for convenience and a “one-stop” buying experience. Carriers who haven’t yet joined the game risk being left behind as market innovators seize market share, revenue and the customers. A recent study revealed that 79 percent of consumers want to use digital channels to research, buy and manage insurance, but only 10 percent of P&C premiums are sold online today. [i] Missing out on a critical opportunity to gain new customers, more than 50 percent of insurers have yet to consider a digital strategy. [ii] Many carriers are stymied by legacy technology and the costly, time-consuming task of upgrading. They leave money on the table every day as consumers turn toward insurers offering channel choice as well as the ability to consolidate all of their insurance needs in one place. 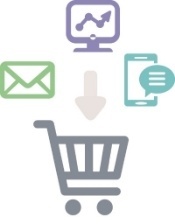 As the industry evolves toward the omni-channel ideal, proven approaches that work with legacy systems, such as a direct-to-consumer digital distribution model, have emerged. This type of offering connects easily to existing infrastructure and quickly communicates with carrier applications, expanding distribution channels without the wait for lengthy upgrades. Insurers are put rapidly in touch with inquiring consumers and are able to meet their needs throughout the entire buying lifecycle, quoting, binding and issuing a full range of coverage, even if the products offered aren’t their own. This ranks them on top of consumer preference lists, allowing them to gain a greater hold on the market and retain customers longer. The carrier’s omni-channel responsibility doesn’t end once the digital signature is set. Since the insurer owns the customer throughout the policy lifecycle, the ability to provide continued interaction with consumers through preferred channels becomes critical to retention. A direct-to-consumer digital distribution model is proficient at relationship management, allowing carriers to cut client acquisition costs in half and inspire greater customer loyalty by providing simple, multi-channel options for handling everything from purchasing through claims. And agents aren’t left out in the cold either, connecting as easily to the system as consumers, they have full access to carrier insights and data, saving time and money through pre-fill capabilities and process digitization. By employing a direct-to-consumer digital distribution model, carriers surpass the challenges of legacy systems and realize the digital omni-channel capabilities that consumers want. Consumers gain access to the complete range of coverage they need, in one convenient place, accessed through the channel of their choice. Carriers attain greater customer retention, substantially increased revenues and a healthy stake of the market. Has the omni-channel revolution passed you by or is your organization embracing the future through digital optimization? Engage more consumers by developing the customer-centered, omni-channel environment they are seeking. To learn more, download our thought leadership piece, Digital Distribution Transformation: The Path to Progress. [ii] "By the Numbers: Insurers Navigate the Digital Transition." Bain.com. N.p., July 2015. Web. http%3A%2F%2Fwww.bain.com%2Finfographics%2Fdigital-insurance%2F.